I have a "Non-Sequitur" comic strip taped to my computer monitor that shows two cavemen carving pictures of prehistoric animals on the wall with primitive instruments. Next to them, another man, standing in front of an easel holding a palette and several brushes, is painting on a canvas. One of the carvers asks, "Oh, sure... technology has made it faster and more accessible, but is it art?" This question has been posed many times throughout history, notably with regard to accepting photography as fine art. It has been raised recently with respect to fractals, or more accurately, images made from fractal elements. Fractals, the graphical representations of iterative mathematical formulas, existed before we had the means or technology with which to see them — a human being simply cannot, in any reasonable time frame, perform the millions of calculations necessary to render even one small fractal image. (Note: For the purposes of this article, I am limiting my discussion to "escape-time" fractals.) Without computers, these images would have remained undiscovered and unexplored. Technological advancements are also responsible for the aesthetic and artistic development of fractals as recent software has placed an incredible collection of tools and techniques in the hands of its users. Fractals have qualities that give them a unique appeal — self-similar shapes that repeat at different magnitudes and locations across the complex plane. There are elegant swirls that spiral infinitely inward, hidden mini-brots from which many spiraling arms extend, branches of dendrites that fork endlessly as the magnification increases, and starry nebulae as limitless as space itself. These are shapes familiar to us yet awe inspiring in their inherent complexity and beauty. But are they art? The American Heritage Dictionary defines art as "1. Human effort to imitate, supplement, alter, or counteract the work of nature." and "2. The conscious production or arrangement of sounds, colors, forms, movements, or other elements in a manner that affects the sense of beauty, specifically the production of the beautiful in a graphic or plastic medium." If a machine — a computer — is essential to their creation, how can we consider the result to be the creative work of a human being? It is important to remember that man does not create fractals. The images we refer to as "fractals" are really just graphic representations of mathematical formulas in much the same way a painting of an apple is a representation of that fruit, not the apple itself. Human beings cannot create a fractal any more than we can create an apple. To carry that analogy further, a painting of an apple shows, at most, half of the apple's exterior surface — the rest remains unseen. A sculpture might portray the apple in three dimensions, but it cannot represent, at the same time, the pulp or seeds inside the fruit. No matter what medium is used, no single work of art can depict the apple in its entirety. The same is true of fractal art. Which parts of the thing to represent, and the way in which to portray them, are entirely in the hands of the artist. So, does this mean everyone who uses a computer and fractal software is an artist? No more than is everyone who picks up a paintbrush or clicks the shutter of a camera. One popular method of fractal creation is to select options at random or enter meaningless numbers into parameter fields until an interesting image appears. Since the formulas and calculations work behind the scenes, it is tempting to assume that fractals are mysterious and magical — made by some whim of the software. This is absolutely not the case! Just because the user cannot always predict the outcome does not mean things are happening at random. Merriam-Webster's Dictionary states that art is "the conscious use of skill and creative imagination especially in the production of aesthetic objects," and it is surely those two qualities that separate the artist from the fractal enthusiast. There are hundreds of fractal galleries on the internet where visitors can clearly see varying degrees of skill and creative imagination. The earliest fractal generation programs produced images in limited (4-bit) color, and although the fractal structure itself was as intriguing as it is today, the presentation was rather crude in comparison. As developments in hardware and software brought us first 8- and then 24-bit color support, and writers began to write formulas that took advantage of these capabilities, the resulting images became more aesthetically pleasing. Subsequent fractal programs have varied in several ways. Some are quite easy to use in that formulas and parameter settings are chosen from a limited list of options. Others offer the user greater control over parameters and a formula parser for custom formulas, but require much more knowledge and skill to operate. Color control and user-interfaces in these programs range from cumbersome, at best, to counter-intuitive. All programs at this point still created fractals as single-layer images. Some artists experimented with combining two fractal images using Pseudo-High-Color and Pseudo-True-Color techniques which alternated two formulas in the rendering process: pixel 1 was colored by formula A, pixel 2 by formula B, pixel 3 by formula A, pixel 4 by formula B... and so on. Depending on which formulas were used, the results ranged from the rare, quite stunning image, to the more often confused conglomeration of color and design. This technique required that the two formulas be hard-coded into one, allowing little experimentation "on the fly." The artist also had no real control over the merging process since each pixel carried the full weight of its formula. On his own, fractal artist Kerry Mitchell was experimenting with layering images using a program called PicLab. Instead of working with completely different formulas in each layer, he generated multiple images using the same formula with very slight variances in location or parameter setting in each image. He then layered the images, controlling the merge so the color values of each pixel in each layer were weighted according to his specifications. One of his images, "Ascension," is a stunning example of this layering technique. L. Kerry Mitchell. Ascension. 1997. Inspired by the beauty of Mitchell's "Ascension," fractal artist and visionary Damien M. Jones pursued the concept of layering, and when programmer Frederik Slijkerman approached Jones about sharing his many ideas for a conceptually new fractal generator, layering was high on his "wish list." 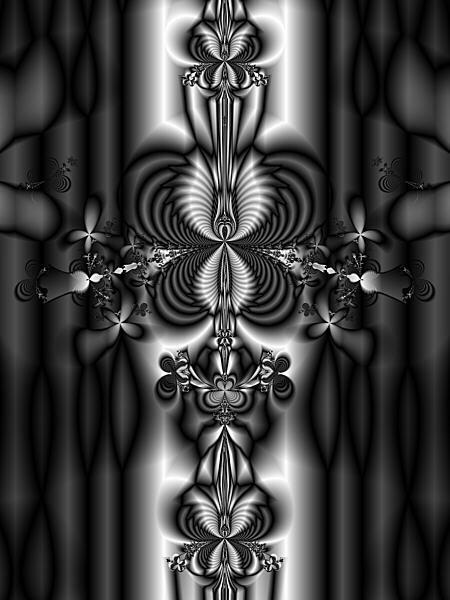 Slijkerman combined his own ideas with those of Jones in a new program, Ultra Fractal 2. In addition to built-in layering capability and other features that I will discuss later, the program places total control of the image, for the first time, in the hands of the user. So radically innovative are Ultra Fractal's features and capabilities that they have literally redefined fractal art in the year and a half since the program's debut. I worked with several other fractal programs before I began using Ultra Fractal. With them, I was always frustrated at the elements I couldn't control or fine tune, particularly the coloring methods and gradients. While I worked hard to achieve each artistic effect and am proud of many of the images I created, I never felt I could take full artistic credit for them. 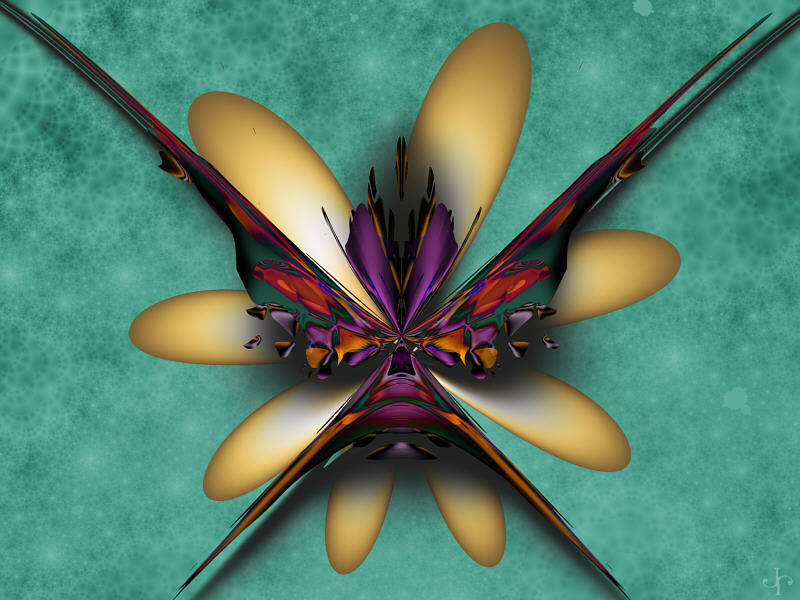 From the beginning of my work with Ultra Fractal, I knew it was an altogether different approach to fractal creation because it placed complete control of the image in my hands. 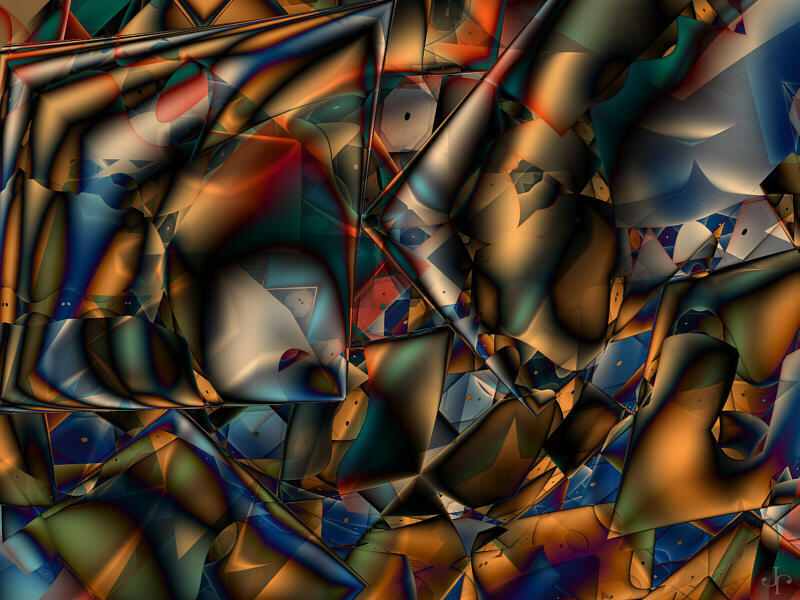 One of the earliest images I created was the three-layer image "Cubist." This early work developed rather serendipitously, but I learned a great deal about the elements over which I now had control and the effect presaged the potential for a new kind of artistry. I also realized that in order to achieve the effects I was looking for, I needed to study and learn what was happening with the formulas I was using. I take my inspiration from the shapes and patterns found in my initial exploration, but that is just the beginning. Not long after creating "Cubist," I was layering three different colorings of a Sylvie Gallet formula and discovered I had the makings of a butterfly. After adjusting the gradients and coloring algorithm parameters to achieve the desired effect, I decided to add a touch of realism by creating drop shadows from the same fractal formulas (with just a change in gradients), and adding a fractal flower-shape on a Mandelbrot background. The finished image requires 12 layers, but it is created entirely from fractal formulas and from within the Ultra Fractal program. I usually begin my fractal exploration using a grayscale palette which allows me to concentrate on the shapes without being distracted by color. The image "Iron Gate" shows how gradients can be used not only to color, but also to sculpt a fractal. It is composed of two grayscale layers that originally looked something like this and in which I saw potential for vertical bars and an ornate figure such as one might find on an ornamental metal gate. In the screenshot below you'll see that by tweaking the gradient for just one of the two layers, and by adding and adjusting several control points with the alpha channel editor to control transparency, I was able to reveal a great deal of detail within the fractal structure. The width of the vertical bars, the placement and luminosity of the highlights and shadows, and the sculpting of the "iron work" were all completely within my artistic control. I didn't change the shape of the fractal, but I decided which parts of it would be visible and in what way. "Iron Gate" before gradient adjustment. Screenshot of Gradient and Alpha Channel editors (left) and finished image (right). Janet Parke. Iron Gate. 1999. To take full advantage of Ultra Fractal's layering capability, I needed to learn to think in layers. I no longer search for a single fractal image that must stand on its own. In fact, most of my works are composed of layers that are quite unassuming (or even unappealing) on their own. As I create, I envision each image as a collage of fractal layers — each contributing shape, color, light, shadow, and texture to the overall work. In "Bello Fiore," I began by exploring a Julia shape, which, when transformed with a hypercross inversion curve, suggested flower petals to me. As I added layers, I not only progressively rotated the image to fill in the circumference of petals, I also altered the angle of the inversion curve to slightly distort the shape of each set of petals and varied the magnification to change the petal size. I tweaked and re-evaluated every aspect of the image many times over as I worked with it. Since my intent was to suggest rather than realistically depict a real flower, I allowed the colors of each layer of petals to interact with the others and not remain opaque. While many fractals created by other programs are easily identifiable as coming from that particular software, I feel that Ultra Fractal gives me the opportunity to develop a unique style of my own. Elements of that style, of course, reflect my own artistic taste — a balance of color, unusual or unexpected shapes; off-center, but balanced framing; use of light and shadow to suggest a three-dimensional feel; texture to add depth and interest; and a sense of movement. Simply put, I am interested in producing striking and singular works of art using fractal elements as a means to that end. 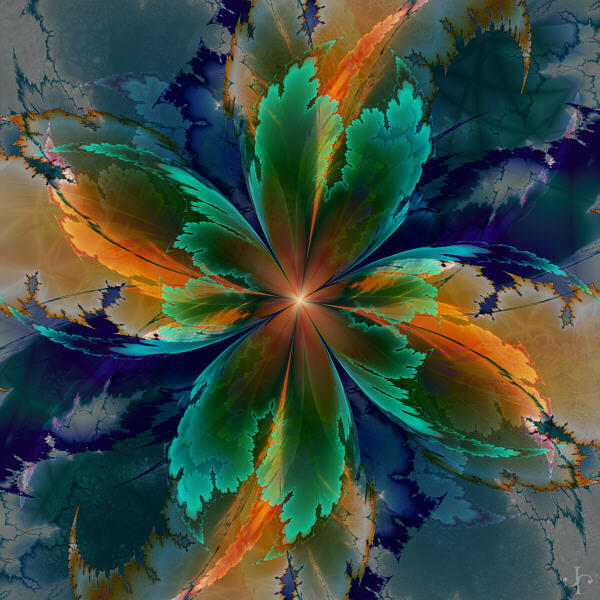 Will fractal art one day be recognized as a legitimate art form alongside more traditional forms such as painting, sculpture, and photography? Will it stand the test of time in the same way works of the great painters have? 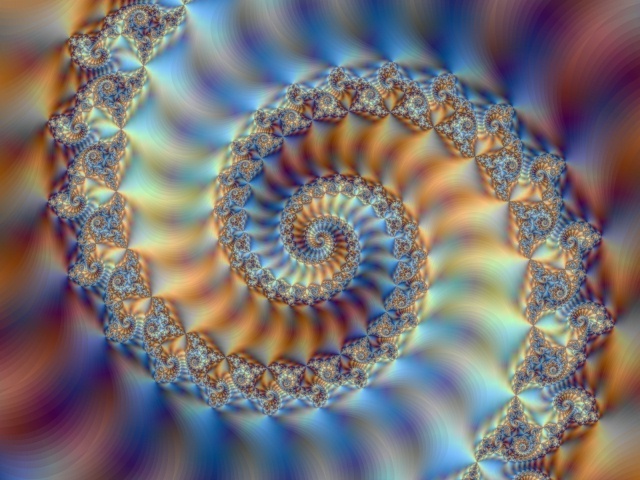 Only in time will these questions be answered, but I contend that we have just begun to explore the artistic potential of fractal art, and it is indeed in the hands of a creative artist — a deliberate, conscious and imaginative celebration of the nature of math.